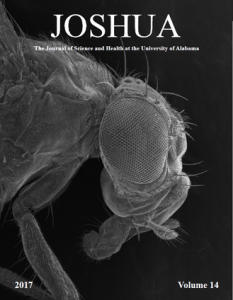 JOSHUA, The Journal of Science and Health at the University of Alabama, is an interdisciplinary research journal that is written, edited, and published by undergraduate students at The University of Alabama. JOSHUA is published once a year and features articles discussing a wide variety of subjects, including but not limited to biology, chemistry, physics, psychology, and mathematics. It has been recognized by the Howard Hughes Medical Institute as one of the nation’s top undergraduate research journals, and some of the work featured in this journal has gone on to win major awards. The JOSHUA staff is currently accepting submissions for the next edition of JOSHUA. The journal primarily publishes research articles based on original student research conducted at UA. However, if a student has not conducted research or would like to write about another topic, review articles about science and health-related subjects are accepted. After article submissions are received, they undergo a review process among the editors. If a paper is chosen for publication, it will be proofread by the editorial staff and suggestions or comments regarding the article will be sent back to the author before it is published. If you are interested in submitting an article for publication in JOSHUA, please visit the JOSHUA website to view the guidelines for submission and to read articles from previous editions of the journal. Please let us know via e-mail (joshua.alabama@gmail.com) if you are interested in writing an article or if you have any questions or concerns.